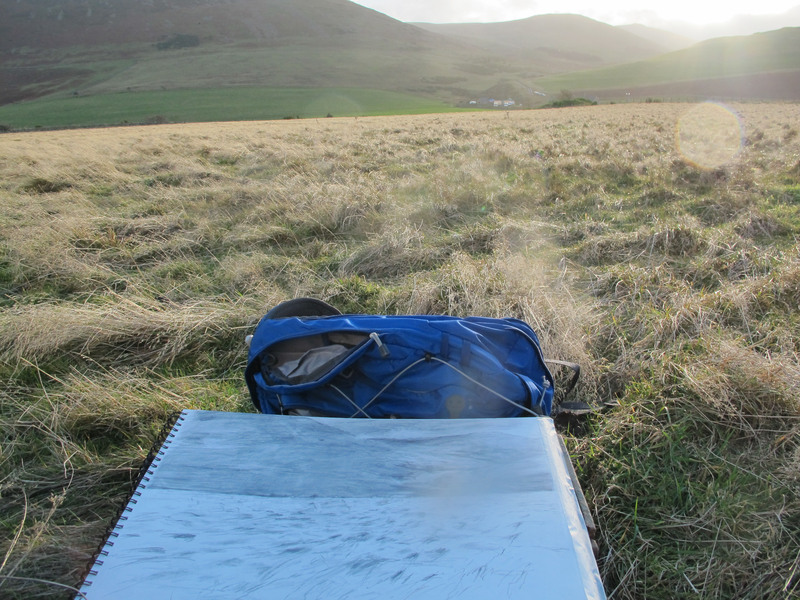 I have just been to Northumberland for 5 days , and , thanks to Letty Ten Harkell’s advice and help, I went to draw at Bamburgh and at Yeavering . 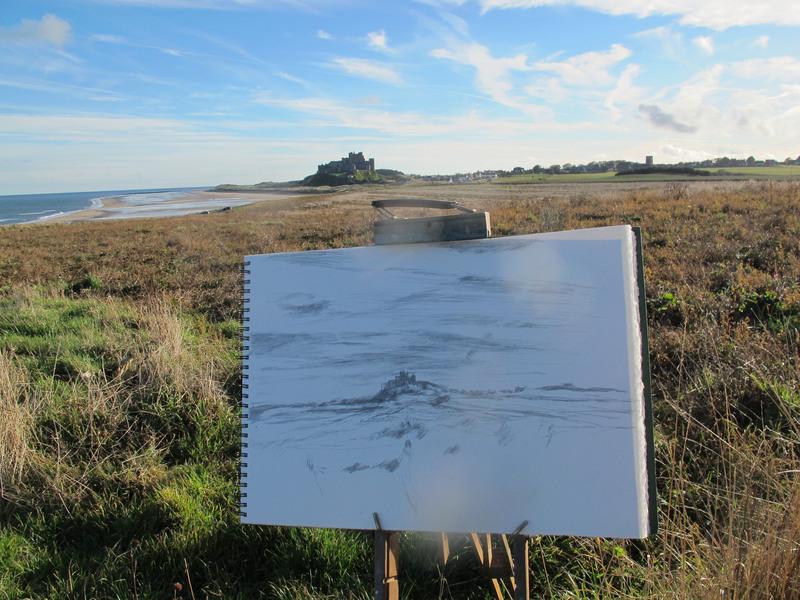 As Graeme Young , from the Bamburgh Research Project commented in one of his very welcoming emails , these are ‘ two very different landscapes’. The BRP is an independent , non profit , archaeological project investigating Bamburgh Castle , since 1996 ,they have been working to uncover the castle and its surrounding from prehistory to the present day. It must be a very exciting archaeological landscape within which to work. 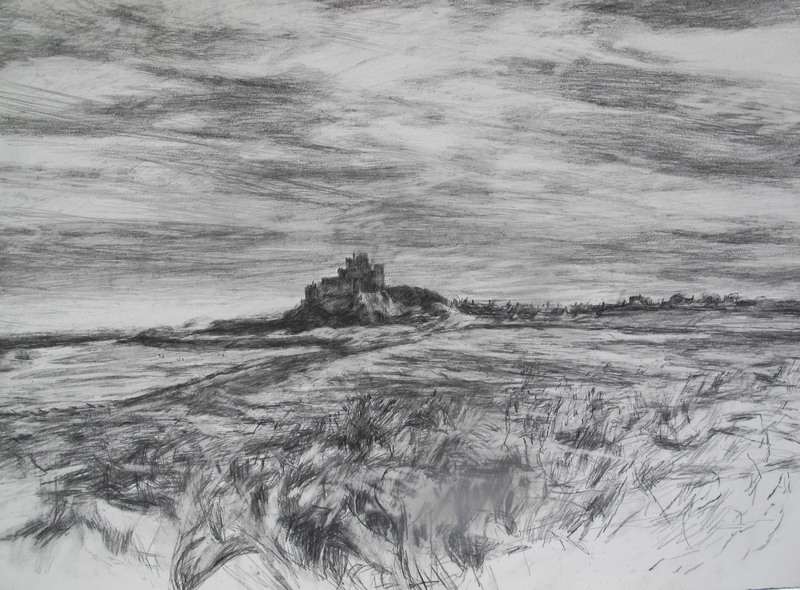 I choose to draw the village and landscape around Bamburgh, rather than view the castle in isolation, the village lies in the lee of the castle. As I drew, however , It came to me that the village not only supports the castle visually, but maybe has always supported the castle as it does now in 2012 , in an important way. At Bamburgh the landscape rolls into the sea , into the sky and twists around the buildings. During four days , I thought of the consistency of the changing sky and weather patterns ( if that makes sense! am I right in thinking this ?) since early human habitation , and the possible other consistencies, of small details ,like the grass and migrating birds, which help to make this special place ,feel historical ,in an extraordinary way . At Yeavering , the consistency of the weather and grass in the landscape, is all that seems left , in an obvious way ,to describe ‘ what by any standards has to be one of the most impressive archaeological landscapes in England’ Paul Frodsham ( Forgetting Gefrin: Elements of the Past in the Past at Yeavering) , the site had already been occupied for thousands of years before it became an Anglo Saxon palace ( known as Ad Gefrin ) , sited in the Past Perfect web site, as having attracted cremation burials, ritual pits, burial mounds and a stone circle, with Paulinus baptising converts for 36 days in the river Glen. 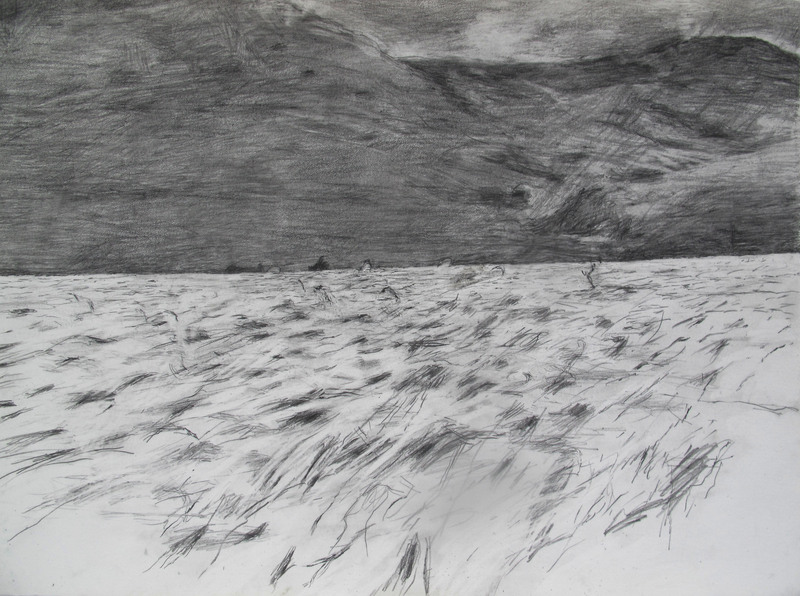 How to understand this very different land ?in the end I sat and drew in the middle of the large field , formerly Ad Gefrin, letting the wind do the drawing for me, hands blown back by the force . The small butts of feathery grass constantly moving, in one determined direction, made me reflect of the amount of collective human endeavor, that had taken place in this large and beautiful field. Ad Gefrin is overlooked and at first glance protected by Yeavering Bell but maybe in parallel with Bamburgh Castle and its village lying next to it , it also supports it and draws from it , in equal measures. My favourite landscape in the world is the hills running west of Wooler including Yeavering Bell. I always lifts me up as I travel the A697 from seeing my parents in Scotland, especially if I catch with the evening sunlight on it. My most magical memory of the same landscape from a different angle was seeing them from Ford Moss on a night hike, the hills bathed in the light of a gibbous moon. I just had to stop and stare, it was so beautiful. Hi , yes it is Miranda Creswell , thank you !